Ireland is a country full of magic, and there couldn’t be a better way to see that magic than by hiring a campervan for your holiday. Ireland is packed with cultural landmarks and natural beauty, and campervan hire allows you to see it all. There are so many sides to Ireland that it’s difficult to see many of them on a conventional holiday. But with campervan hire you have complete freedom to move from one place to another, to see the big sights or get off the beaten track, and to discover the magical places that will make your holiday one to remember forever. Ireland naturally lends itself to a campervan holiday. It offers some of Europe’s most pristine and spectacular areas of natural beauty, such as the wild mountain landscape of Connemara in Galway, or the magnificent Cliffs of Moher, towering over the Atlantic Ocean, where people once stood to warn of Viking invaders. By choosing campervan hire for your holiday, you not only have easy transport to the sights, but you also have the chance to stay right within the attractions you came to see. Other tourists can only take day trips, with all the hassle and extra travelling that involves, but you’ll be left with the amazing feeling of everyone else going home and leaving you with some of these breathtaking sights all to yourself. There are the serene, otherworldly Lakes of Killarney in Kerry County, and in Antrim there’s the famous Giant’s Causeway, the stunning natural rock formation that looks like a path created by mythical giants. The great thing about hiring a campervan for your holiday is that you have complete flexibility to create your own itinerary and set your own schedule. So you could sample some of Ireland’s historical sights, and visit Blarney Castle to kiss the Blarney Stone and receive ‘the gift of the gab’, or discover the mystery of pagan Newbridge, a sight older than the Pyramids at Giza. If you’re looking for adventure, Ireland’s coast, hills and rivers offer some of Britain’s best sailing, surfing, gliding, pony trekking, rock climbing, walking and fishing. And if you’re looking for culture there’s something for everyone in Dublin, with Dublin Castle, the ancient library of Trinity College, theatres, shows and of course Dublin’s famous pubs and distilleries, including the brilliant museum in the Guinness factory. Ireland’s campervan parks are some of the best in Europe, offering you excellent facilities on your campervan holiday, as well as many activities for both children and adults. Choosing campervan hire for your trip also makes for one of the most comfortable ways to see Ireland, as you travel when and where you want and always have the choice to stop off in place you like, spend extra nights or move on to discover new areas. Hiring a campervan is also one of the most economical ways to visit Ireland, as you have a moving accommodation base with you so you save on hotels and any additional transport. 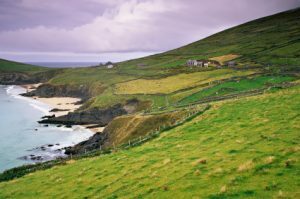 Campervan hire in Ireland makes for a holiday to remember!